The first ever Cornish Pasty Week – success beyond measure! 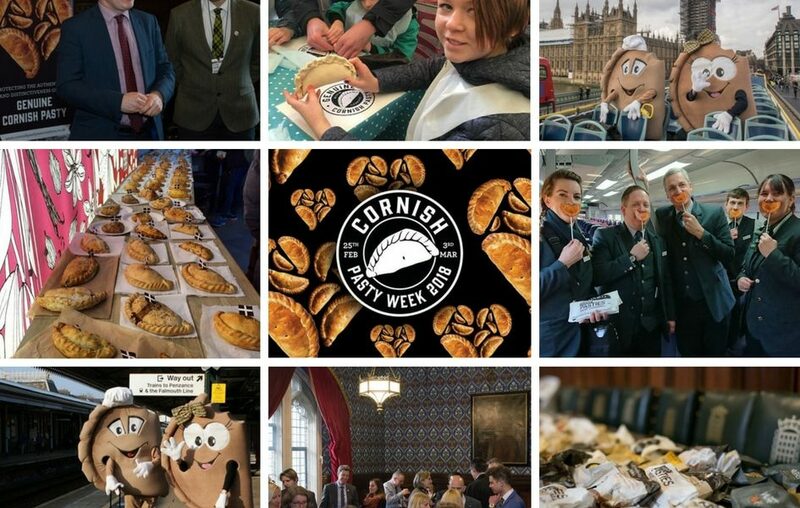 Thanks go out to everyone who got behind the first ever Cornish Pasty Week, which took place from 25th Feb to 3rd March. We knew it would be popular here in Cornwall; we were pretty sure it would be popular throughout Britain, but little did we know it would reach pastylovers across the globe. From Falmouth to the Falklands, millions of people joined in with the week-long celebration of our hero product. Kicking off the week, Chris Evans, pasty fan extraordinaire, hosted a bake-off with a difference and invited three Cornish pasty makers to ‘Pitch their Pasty’ live on his BBC Radio 2 Breakfast Show. Tucking into the freshly baked pasties, the breakfast team tactfully declined to declare their favourite on air but the feature was part of a message that sparked the highest level of media interest in Cornwall’s iconic pasty since the Pasty Tax debate. We’ve estimated that up to 30 million people all over the world heard, saw or read about Cornish pasties as TV and radio stations, magazines, newspapers and social media channels spread the message. Just as Chris Evans was announcing Cornish Pasty Week to the world, two life-size pasty characters, Mr & Mrs Pasty, were embarking at London Paddington from GWR’s Night Riviera sleeper service after travelling overnight from the depths of Cornwall. The loveable couple spent the day hopping on and off an open top tour of the sights, courtesy of the Original London Bus Tour, taking the Cornish pasty love to Buckingham Palace, the London Eye, St Paul’s Cathedral and Trafalgar Square along the route. The same day, Cornish pasty makers also converged on the capital for a formal reception with MPs and civil servants, who filled the Jubilee Room in the House of Commons and heard rousing speeches from Cornish MP and Defra Minister George Eustice and Cornish Pasty Association Chair Jason Jobling, before devouring 200 Cornish pasties sent from bakers all over Cornwall. As a result, we are already forging stronger and closer links with policymakers at this critical time. At one point that day, #cornishpastyweek was trending in the top 10 on twitter and a tweet from Defra has been retweeted 800 times. During the campaign, the Association’s Facebook posts reached an audience about 30 times greater than during the same period in 2017 and over 10,000 new people discovered this website. Back home, the Beast from the East held us in its icy grip. But what better time to celebrate one of the world’s greatest comfort foods, which doubles as the perfect hand-warmer? Proper job! Hats off to the crew at the Eden Project, whose World Pasty Championships provided the grand finale to our special week. With the odds stacked heavily against them after the Beast had done its worst, they pulled off a magical day, as always, and the CPA volunteers had fun helping a record 200 children make and bake their very own truly Cornish pasty. Plans are already underway for next year’s Cornish Pasty Week, which will run from February 24th to March 2nd. Watch this space or follow our social media channels for updates and get in touch to share ideas.